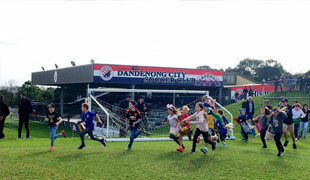 Dandenong City Soccer Club celebrated its Golden Jubilee Year in 2003 (50 years), and has been providing opportunity for people from all kinds of background to play the world game. Dandy City is steeped with history, experienced the dizzy heights of NPL1 soccer through to the lows of Provisional Three and has been through quite a number of changes and transitions in the past. For the last two decades the club has managed and preserved its use of the premier facilities named after Frank Holohan & located at Baden Powell Drive, Endeavour Hills, managed by the City of Greater Dandenong. In 2008 the Club was approached by the Chelsea Soccer Club about a possible merger of the two clubs, a merger that would provide a better path for our talented juniors coming through the ranks, enhance and broaden the image of the club, as well as bringing together multiculturalism and a pathway for all the members of the club. Chelsea Soccer Club would bring with them over 25 years of history, together with a vast knowledge of football (soccer) sense as well as substantial number of members. Chelsea Soccer Club held a State 2 League position for its Senior Men’s Team which attracted many sponsors and members. Both clubs believed they would benefit financially by the merger, which would ultimately keep costs down for its members, as well as increasing the support of volunteers that is needed to manage this fast growing sport. The merger would also build a pathway for Juniors, Seniors and Women’s teams to have a high quality coaching, improved management and also be able to serve our local and wider community in enjoying and participating in this great world game. Discussions were held between both Committee members and representatives from Football Federation Victoria. Both the clubs were at that time governed by Football Federation Victoria. The amalgamated clubs would be known as Dandenong City Soccer Club, and would continue be based on the approved allocation of facilities at Police Paddocks Reserve, Baden Powell Drive, Endeavour Hills, known as Frank Holohan Reserve, under the jurisdiction of City of Greater Dandenong. The Chelsea SC known to its members as the Hajduk SC had been in existence in the same location in Edithvale for over 25 years with very little improvement to their facilities & playing conditions. The club has grown considerably in the last 5 years with over 250 juniors at the club. It had become increasingly difficult to accommodate all 350 players at a venue with two pitches & two change rooms for all these players including Women & Girls. Any planned improvements by council were not expected before 2011/2012, these improvements were primarily to the pavilion, leaving the playing area as a ‘C’ Grade venue. With the Chelsea Senior’s at that time competing at State 2 level it was very difficult to set goals beyond playing at that level given that we would have to play at an alternate venue. The amalgamation with Dandenong City SC was seen as a strategic way to grow the sport further in the region, as well as providing a great opportunity for both club members to have the room for growth and provide members with facilities that will be utilised to its capacity for both clubs. Over half of the Chelsea members & supporters lived within the region of the City of Greater Dandenong, with many more members possibly also joining the new amalgamated club, as it was in close proximity to their place of residence. The new structure was always going to be dependent upon the development of good personal relationships between the clubs, bringing together key personnel with ideas and a common vision to deliver the increased demands in growth, facilities and a safe friendly environment for all to enjoy. Both clubs fully understood that to create a successful amalgamation, it would require careful planning, negotiation and willingness. From discussions held between Committees, Governing Bodies and members of both clubs, the plan to amalgamate was enthusiastically received by all. After a long winded process & many meetings & document reviews the formalization & amalgamation of Dandenong City SC & Chelsea Hajduk SC finally happened in December 2008 the two clubs coming together was to be known as Dandenong Football Club as per the wishes of the FFV, but unfortunately the name was already registered & we therefore reverted to Dandenong City Soccer Club. A new logo that incorporated parts of both of the previous clubs logos was designed to provide a new look going forward. In the clubs inaugural year, the management committee was made up of both Dandenong City & Chelsea members with the Presidents of the two previous entities, Bill Matotek(DCSC) & Tony Dorotic(CSC) appointed as joint Presidents for the first year. 10 years on, we are proud to say the vision of the merger of these two clubs back in 2008, has proved everything that the respective groups expected of it. The club is a hive of activity with members of the two clubs joining as one enjoying social activities as well as some reasonable Football being played at all levels. Almost all of the same committee members that were brought together as part of the merger, still 2 years on continue to work alongside each other for the good of the Dandenong City Soccer Club. We would like to acknowledge the efforts of all the previous & current members of these two clubs as well as the life members that have been a part of both clubs proud history. To ensure that our football programme will maximise participation and enjoyment for all our Junior / Senior Male and Female members, as well as actively working together to operate a successful sporting facility to be enjoyed by our local and wider community. Increases member’s participation from the local and wider community. Target areas in the community whereby children are from a poorer background, encourage them to join our club, whereby they will be in a safe and friendly environment. Apply for grants to enable the club to be able to accommodate its members who cannot otherwise afford to join a club. Meets the development levels of all junior and senior participants in competition. Offer opportunity in the expertise of club officials, coaches, players and volunteers. Help our most talented player’s to be able to reach their ambition in regional, state and even national levels. Copyright © 2019 Dandenong City Soccer Club. All Rights Reserved.